The majority of my work is commissioned,with much of it inspired by the new pieces that have been designed and made for exhibitions. As a totally self-taught designer/maker, my aim is to produce furniture which stimulates the senses. I tend to work intuitively, designing and creating at the same time. Starting with basic concepts, which have obvious functional requirements, I like to keep my mind open to new possibilities as I'm handling the timber and tools. Slightly sculptured curves transform the hard edge of an otherwise flat surface, resulting in subtle changes in grain orienation. This, combined with the effects of light and shadow on these curves, induces a quiet softness to the work. As wood is an extremely tactile material, I strive to impart this quality to my furniture. Often I judge the appropriateness of the size of components in furniture as much by feel as by appearance. Generally, my work has been described as having very clean ,uncluttered lines, and displaying simple elegance. The work presented here is a selection from the varied range of furniture produced over the past 15 years. A great deal of the work over this time was made from a wide variety of Eucalyptus and Casuarina timbers. 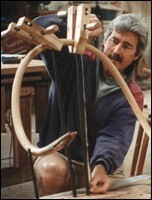 I also use classic Australian furniture timbers such as Red Cedar,Rosewood, Silver Ash and Blackwood.